Welcome to the service that launched MBizTools, LLC. In 2012, the MBizCard was created to help people searching for new jobs. It quickly evolved to a networking tool embraced by sales coaches, real estate agents, automobile dealers, and network marketers. Since then, we have added users in all industries that focus around sales and customer support. If you are serious about networking more efficiently while providing a professional means of getting your contact information saved to your current and prospective client's phones and contact list then you need to get your MBizCard Today! Recent BONUS Features for STARTER PACKAGE! Until November, 2018, the only features available to the Starter/Basic package were those listed above. As we added some new features to other packages, we decided to allow all current and new Starter Package users with two features that were previously not available to them. 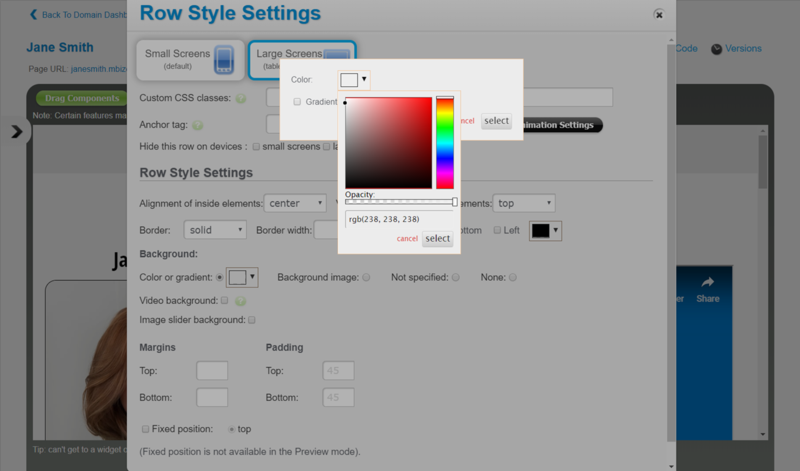 With your Personal or Enterprise account, you can change the color scheme of your MBizCard. This allows you to make sure your MBizCard compliments the brand of your organization. All you have to do is log in to your dashboard, click either the Widget or Row you want to recolor and make the changes as needed. Sometimes you just need to share with everyone a promotional PDF, Word document, spreadsheet, or an audio/video file. 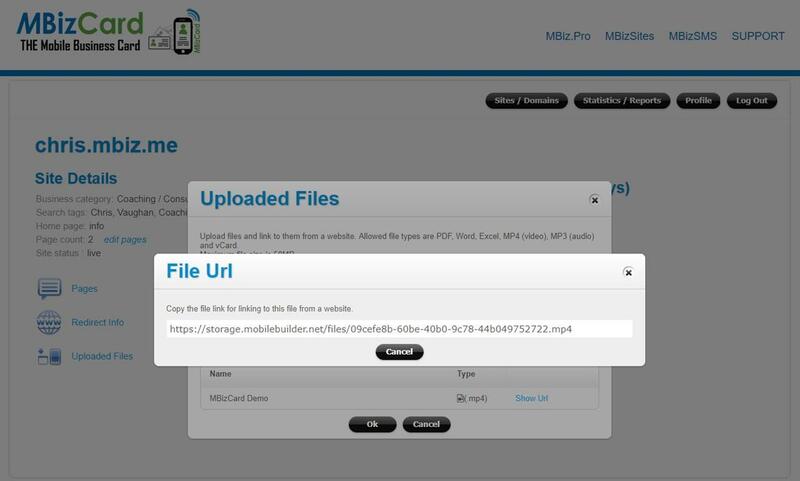 These files are not password protected, but as long as they are under 50MB each, you can upload as many as you would like and add their links to the menu of your MBizCard. While the Starter Package might be a great solution for you, there are a number of features that make it worth looking at the Personal and Enterprise packages. Below is a brief explanation of each and how they will help you network more efficiently. Want to make your face or your logo an app icon? Want to insert pixel or other tracking codes? Want to update your SEO settings? These are all things you can do when you upgrade your MBizCard. 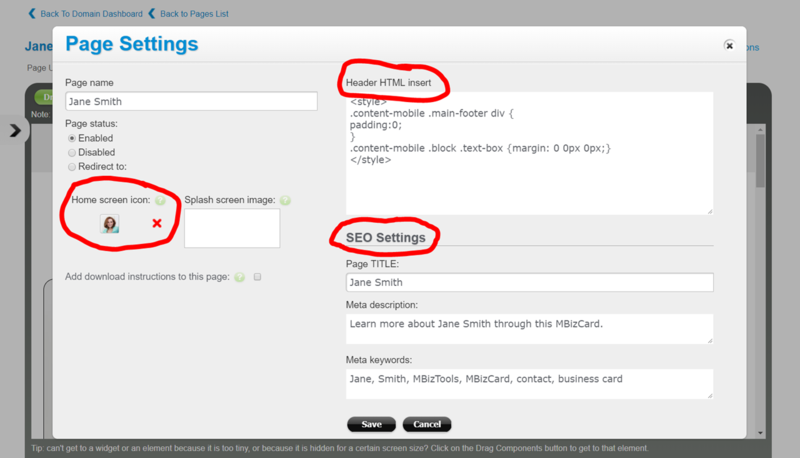 Simply access the Page Settings when editing your MBizCard and make the changes you want. You can easily add a secure third-party widget. This could include embedding your shopping cart, custom forms, social media feeds, video playlists, and much more. 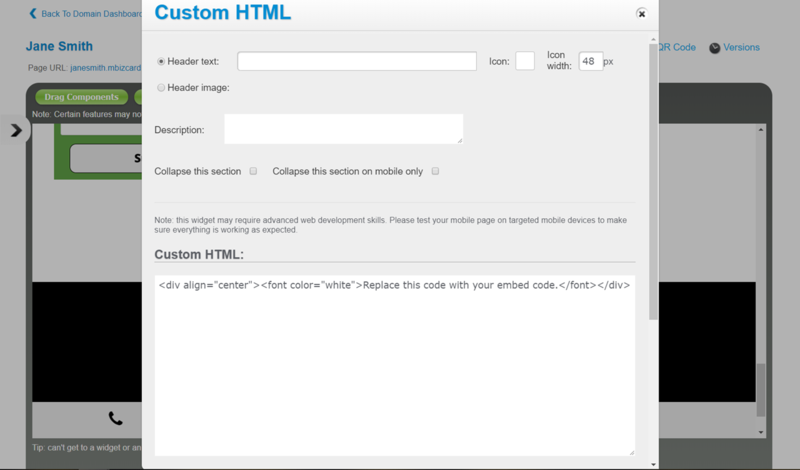 Simply open the Custom HTML widget and replace the existing code with the code you want to appear. 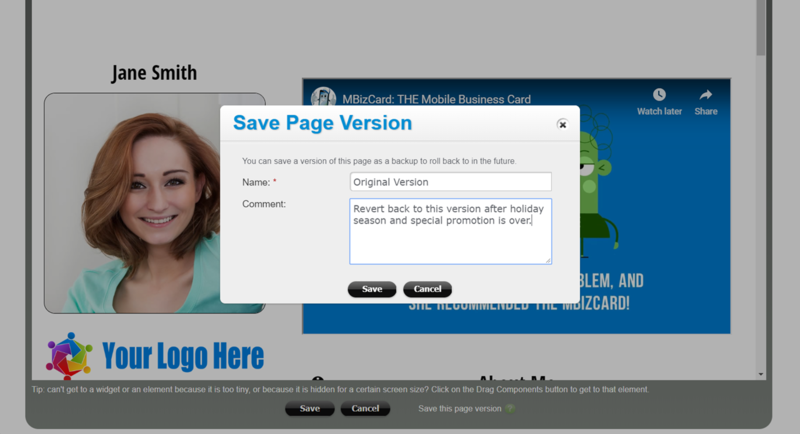 It is very rare for users to go through an entire year without wanting to tweak some part of their MBizCard. Whether it is because you want to feature a special offer for a product or service or want to share holiday wishes, you can create versions of your MBizCard so you do not need to make all the changes when you want to return to your original design. 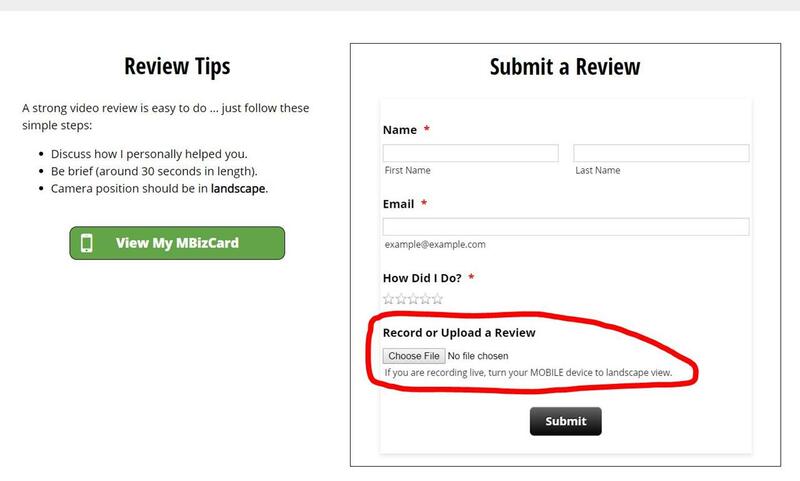 While you can easily add links to capture written reviews from your menu, there is a lot of value in receiving video reviews. With this upgrade, you are able to capture unlimited video reviews​ and access them anytime so you can share them on your MBizCard, website, or video platform. The "Connect with Me" form is designed to encourage users to send you a message or share their contact information with you. With your upgraded account, you can choose which fields to display and even add new ones. You can also add other email addresses to receive information when entered or redirect users to a special offer page if they complete the form. Use your MBizCard as the first step of your personal funnel! 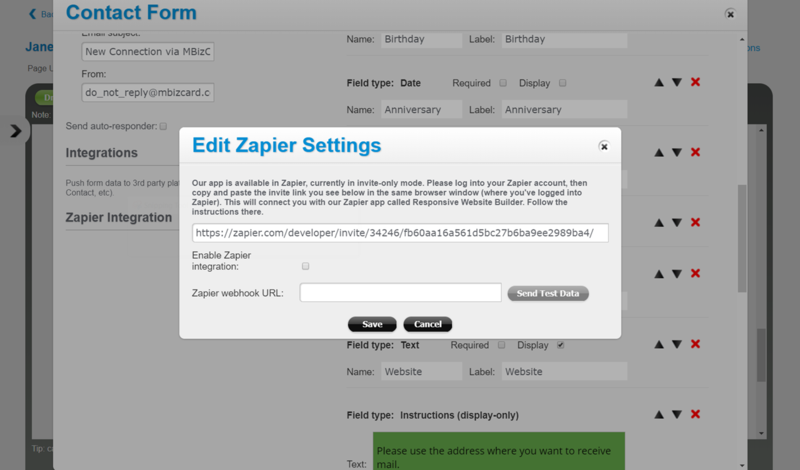 One of the best ways to improve your efficiency is to use our Zapier integration with your "Connect with Me" and "Submit New Leads" forms to the various cloud-based applications you are using. This is perfect if you are using a CRM (client-relationship management) platform, an autoresponder to send out mass emails or text messages, or any other application that you use to grow your organization. We offer two custom plans for these situations. One allows for special bulk pricing using the MBizCard brand and one that allows your organization to completely private label the platform so there is no reference to MBizCard or MBizTools, LLC. Please schedule an online demo to learn more. These solutions are perfect for associations, chambers of commerce, direct selling companies, networking groups, and organizations with large sales or customer support teams. Yes! This works on any device that can access the internet. It was built for smartphones but has a responsive design feature that enables you to look great on tablets and computers. Where can I share my MBizCard? You can share your MBizCard anywhere you can share a website link. This means you can add it to the signature line of emails, text it to other people, and even add it as your website link on social media profiles. Want to track your leads and automatically have an email (All Accounts) and text message (Personal and Enterprise Accounts) sent with a link to your MBizCard? If so, read the question and answer below. How does the "New Contacts" Page Work? Great question. This feature was added so that you had a more efficient way to track your new contacts. Note, this is not designed for people already in your database (although you can add them if you want). It is designed so that when you meet someone new, you can record that meeting and make a note of it. You can input all relevant information and even take a picture of their business card or handout so you don't have to keep the paper version. Want to add a note about how you met them? You can do that too. On the Starter Package, when you submit a New Contact, an email is sent to them automatically with a nice message and link to your MBizCard. On the Personal and Enterprise Packages, you can edit the message and you can set it up so that text messages are also sent to the individual if you enter their Mobile Number. Does the MBizCard replace my paper cards? Great question and one we get a lot. The answer is no. It is designed to compliment your paper cards. Research has shown that it takes 5-12 contacts before a new lead will consider working purchasing from you. The MBizCard provides you with a reason to maintain contact with new leads. There are times when we recommend leading with the MBizCard and times we recommend leading with a paper card or promotional product. We cover all of that during the Getting Started webinar and are happy to answer questions during an online demo or Q&A session. Yes! We offer two types of training. We have a recorded Getting Started Webinar and videos on the support page that cover how to make updates to your MBizCard. In addition, we provide at least 3 LIVE Q&A sessions every week where you can get on the webinar and ask questions that will be answered during the call. Do I have to manage my contacts through the MBizCard? No! One thing we have always strived for is flexibility. There are so many contact management systems that we are not trying to compete with them. Instead, we want the MBizCard to work with your current infrastructure. For this reason, you are able to download all contact submissions in an Excel file. If you are on a Personal Package or Enterprise Package, you can control the contact form and even integrate it with over 1,000 cloud-based applications. This is a great way to get your leads directly submitted to any system you are using to manage your contacts. Can I use it to track all my new leads? This is not a contact management system and therefore does not "track" your leads. However, all MBizCards come with a special New Contacts page that you can easily save to your homescreen. 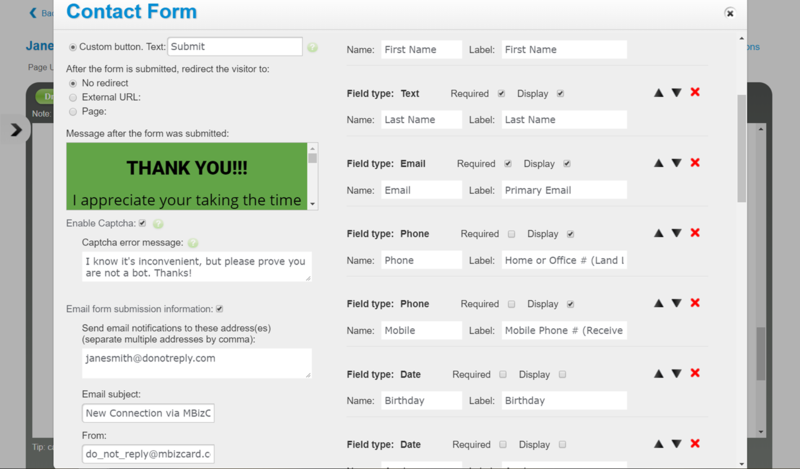 This form allows you to easily submit new leads and even export them anytime you want. In addition, Personal Package and Enterprise Package users are able to integrate the forms on both your MBizCard and New Leads page. Yes. If you would like to get the Starter Package and then upgrade you can easily do that. You can even take advantage of the Annual Subscription discount and upgrade. When you request to upgrade, you will only need to pay the prorated difference between your packages. Can I downgrade my account anytime? Yes. Please note that when you move down from the Enterprise Package to either the Personal or Starter Packages, it is likely that you will have a number of MBizCards with URLs that are no longer operational. It is suggested that you start with either the Starter or Personal Package and then decide if you want to upgrade to the Enterprise Package. No. You may cancel your account anytime but your card will remain active through your current subscription. We do offer a prorated guarantee on Annual Subscriptions if you cancel within the first 30 days. This means you will receive a refund of all but the equivalent to a one-month subscription of the plan for which you registered. * As we have grown, a number of users asked about the ability to become an affiliate. We will cover all the details during your demo or onboarding webinar. The two-tiered level provides users with a way to earn between 20%-40% commission on all subscriptions provided by MBizTools Services. ** The Zapped Automation course is provided to all Enterprise Users as a thank-you gift. Any FREE or Personal user is welcome to take the course for a one-time investment of $49.95. Simply contact us for more information.